A few of the inspirational cheese makers we have met through the years! We've gone out to visit artisan cheese makers who are changing the public's view of cheesemaking in America. We hope our stories on them will inspire both cheese makers and cheese lovers alike. True Home/Farmstead cheese making on a small scale. Carol and her daughter Christina have a small farm in western MA where they care for a small herd of goats from which they make cheese for themselves and friends in their kitchen, a very traditional way much as our grandparents may have done. John and Janine Putnam at Thistle Hill farm in Vermont are making one of the finest mountain style cheeses in america today. Joe Widmer follows a family tradition making brick cheese and he still makes the same cheese his grandfather began with. He even uses the same bricks. 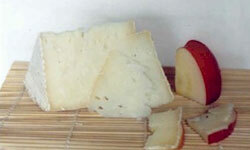 Mariano makes some of the best traditional 'English style' bandaged cheddar found in America today. the details on how he makes it at the Fiscalini Farm. He has only been making cheese for 3 years but he really has figured it out ..he has engineered everything he needs on a small scale to work just like the 'big boys'. 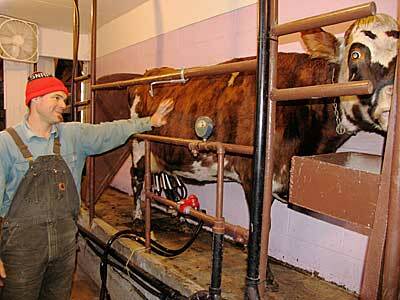 They are quickly coming up to speed in ther raw milk program and making their farm more viable. In November of 2008, the Vermont Institute of Artisan Cheese making at the University of Vermont brought two of the top French Alpine cheese specialists from Poligny France (French National Institute for Agricultural Research <INRA>) for a very special workshop exploring several of the Mountain Cheeses of France.